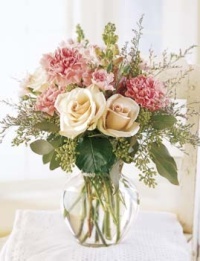 Soft peachy pink roses combined with pink carnations clustered in a vase. Perfect size bouquet for someone in the hospital or nursing home who has limited space. Available for same day delivery in the Warren area.